For years I worked at home in a corner of the living room, at a desk bought from a garage sale. We still had 8 kids at home and the youngest two were preschoolers. I needed to keep an eye on them so I worked in the midst of everything going on. Years passed, we moved, and for a few brief months I had an actual designated room for my home office. Then someone moved back home and that was the beginning of college students in and out of our house. The season for our family had changed and for the first time, I had a master bedroom home office. When we moved, we purchased a corner desk and it worked fine for a few years. But eventually I needed something better. The configuration of the desktop left little room to spread out work and it had a single small drawer. As part of a year-end evaluation of my business, I decided to start looking for a new desk. It needed to have room for my desktop computer, have decent storage, and fit the style of my bedroom. 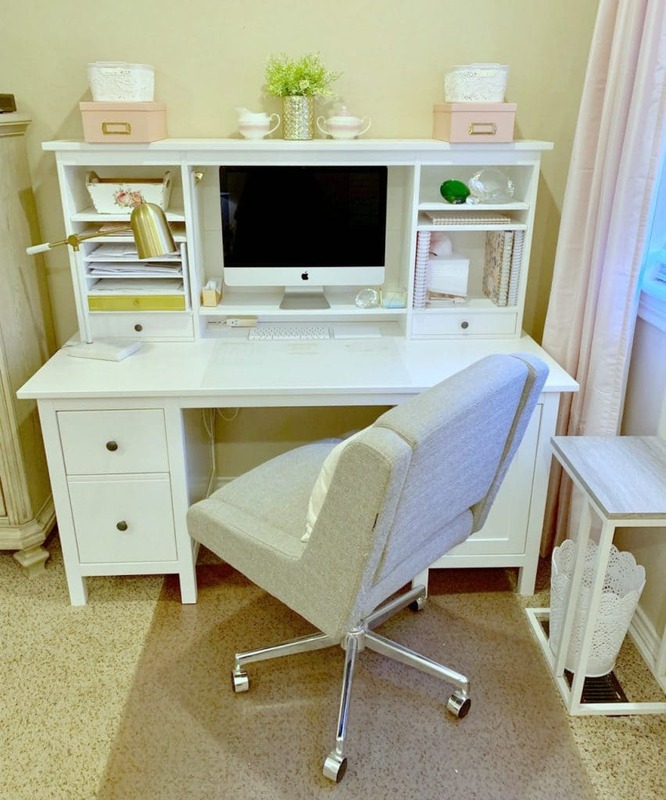 After several weeks of searching for the perfect desk for the office corner in my bedroom, I ordered a white Hemnes desk from IKEA. It arrived in three boxes and sat in the living room until the next day. That night several of the guys in our family came over for tacos and a building party. They got it mostly built that evening, and a few days later my husband finished the project. At last! 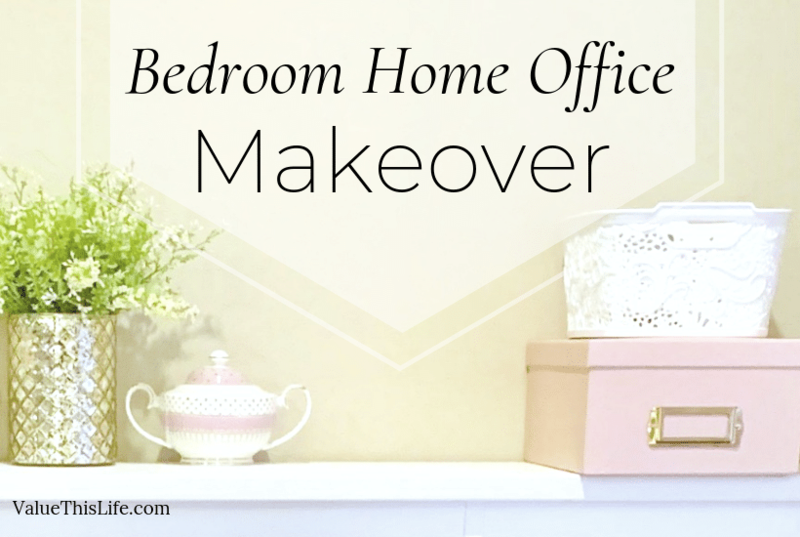 It was time for a bedroom home office makeover! The “before” photo shows the small area with a corner desk with limited desktop space and storage. I’m not saying that the new desk will never get messy, but it’s easier to keep a clean desk when it has adequate storage to begin with. The lack of storage in the desk created the need for a bookshelf and stuff on the floor. It wasn’t horrible, but it looked cluttered and that wasn’t the look I wanted for my bedroom….or workspace. Of course moving out the old desk meant emptying the drawers and dragging out All The Things. For a few days my bedroom was chaos! But it was a good time to sort through, declutter and discard. I kept thinking about what I used daily, what I didn’t need to have at hand (or at all), and how I wanted it to look when it was finished. In the midst of the project, the biggest surprise was discovering how much STUFF had been stored in my bedroom home office that was not being used frequently. No wonder it felt crowded and cluttered! I made a rule for the new desk that ONLY frequently-used, important items would make the cut to be stored in the desk. That may sound obvious but from the amount of junk that was discarded or moved to a non-prime storage area, apparently it wasn’t! 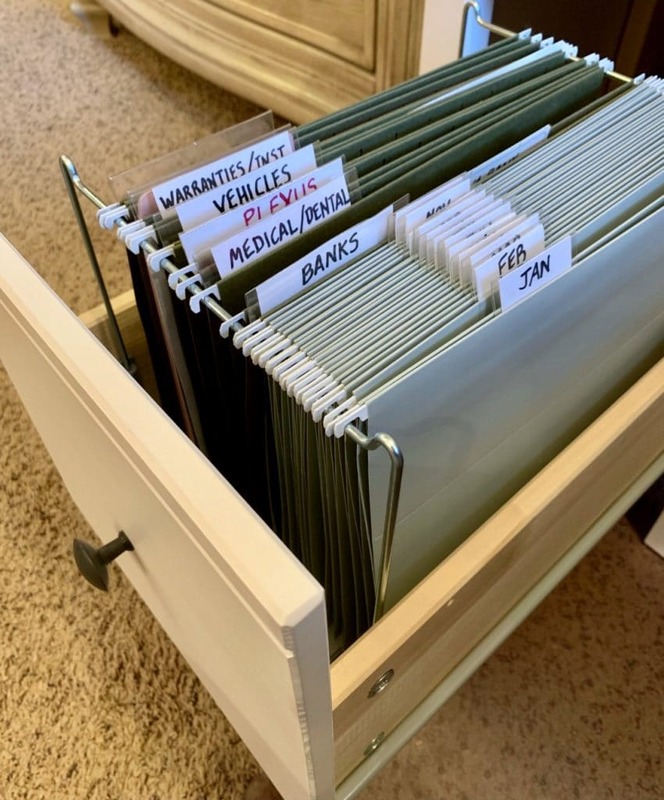 The file drawer was also reworked during the makeover. New files were set up for January to December and a small number of “other” files: Banks, Medical/Dental, Vehicles, etc. Items will be filed in the month during which they come in, except for the “other” file items. A large black trash bag was nearly halfway full by the time the files were purged and decluttered, and it felt good! Many people use marker boards in their home office for to-do’s, reminders, strategy and more. I actually prefer the feel of pen on paper, but wanted a way to keep tasks visible nearby. 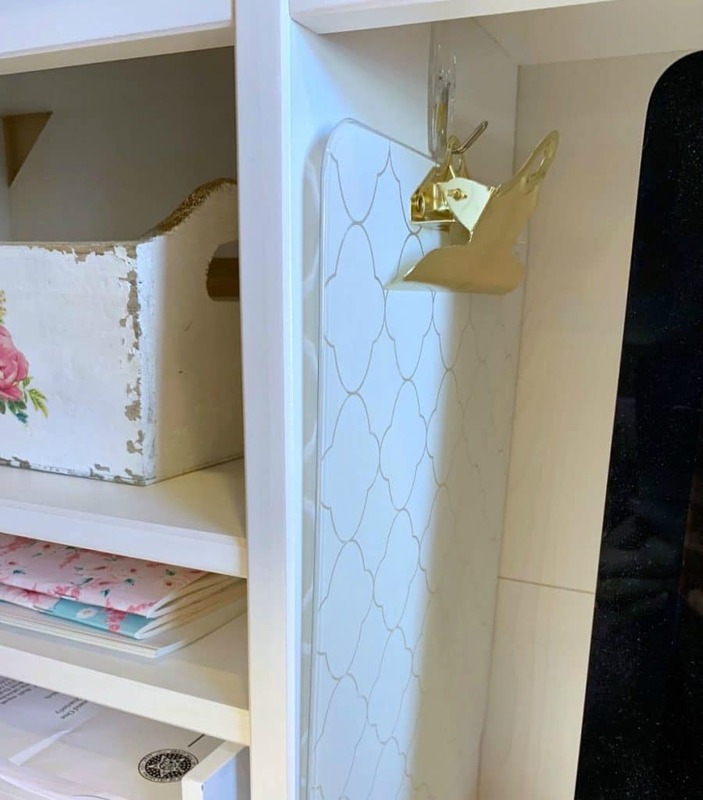 A removable adhesive hook was applied inside the desk hutch and a pretty clipboard hung there for this purpose. We super-glued the hinged hook part because it moved with the clipboard, making it hard to remove from the hook with one hand. I like having a legible calendar near my desk so I can glance at dates for scheduling work events without having to swipe my phone to find the calendar app. A wall calendar is the usual solution but there is literally no place to put one. Instead, I found a large clear desk mat at Office Depot. 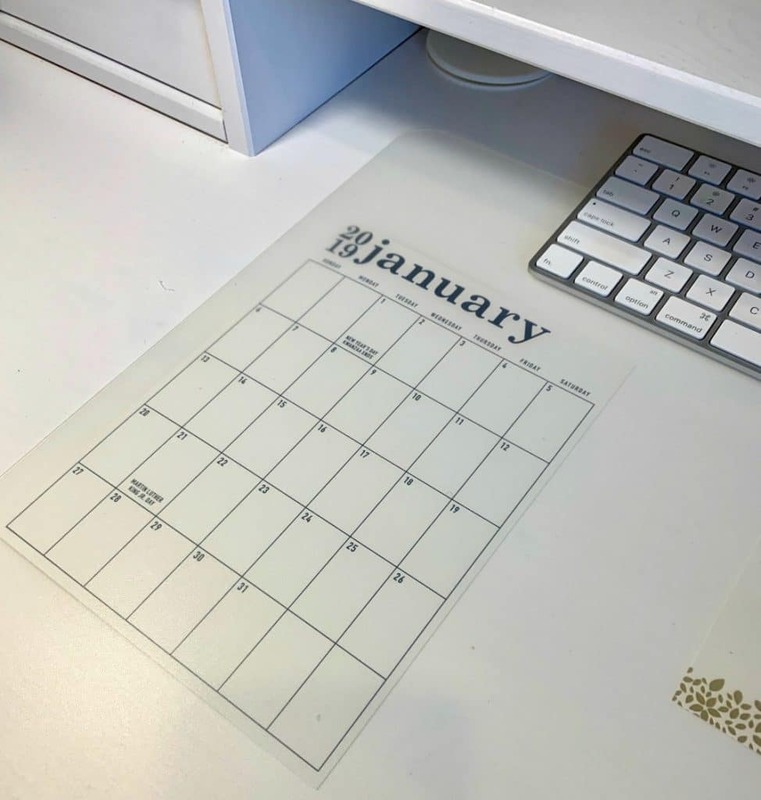 Besides protecting the white desktop and being a place to display photos and reminders under the plastic, a small calendar page fits here, too. The calendar was purchased at the Target dollar spot for $1, and the next month’s page will be removed from the calendar, trimmed and switched out at month’s end. The finished project is way more organized and efficient! And pretty, I might add. It’s important that our workspace be inspiring so that it’s a place where we want to spend time. I found plastic “lace” baskets and a matching trash can at Ross (the trash can was $2.99!). The pink boxes came from Hobby Lobby (2 for $4.99 on sale), and they hold stationery, stickers and pens. Of course a nice new desk is awesome, but the previous workspace could have been greatly improved without one. Clearing out unnecessary office supplies, notebooks and books goes a long ways towards creating an efficient space. Use what you have, think about how you can improve what’s not working. I went into the project determined to simplify and “productify” my workspace. 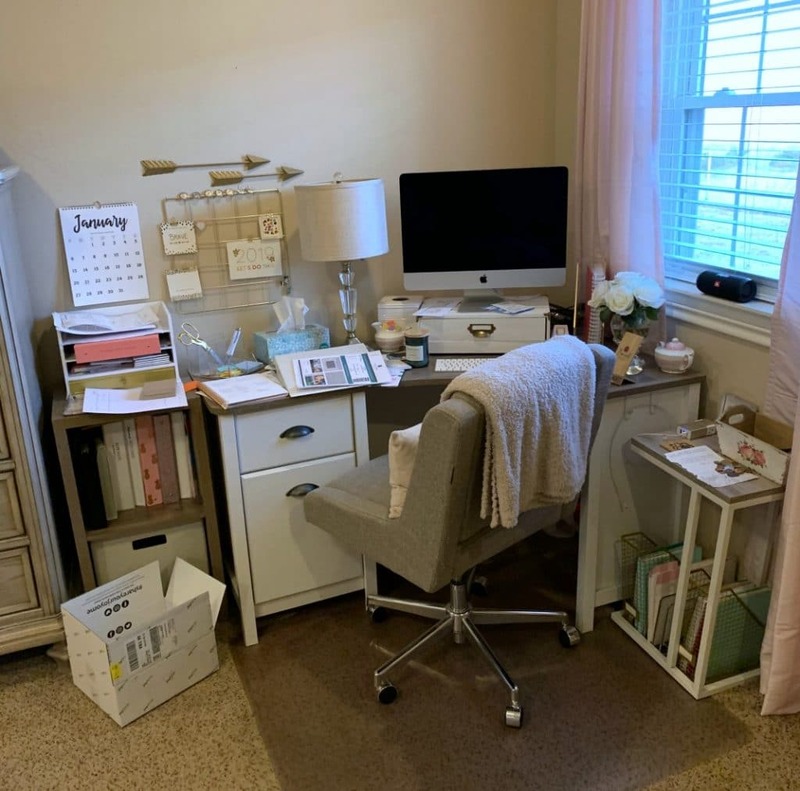 I love this new version of my bedroom home office so much, it has inspired me to apply the ideas in other areas of my house! Wow! I love the pink and white! It looks great and would inspire me as well. The soft colors are relaxing and refreshing. This was so beautiful and encouraging to look at because having a makeover takes, time, thought and creativity! even the wastebasket looks so pretty and the whole area is lighthearted so the work done isn’t burdensome! I am so very happy for you and blessed to get to know you more! Thank you for sharing your life with all of us ladies who want to learn!! Charlotte, as always, in everything you share you are a blessing to us all. Wonderful ideas that’ll help us. Great makeover!!! God bless you!! Hugs.